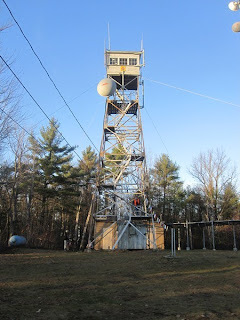 HockeyPucks hiking and highpointing: Oak Hill Fire Tower - 970 Ft.
From 93 take exit 16 East 0.2 miles to the intersection. Go straight across onto Shawmut street for 0.75 miles to the Y intersection. Bear left onto Oak Hill road and follow it 3.1 miles to Oak Hill Tower road. Limited parking is available on the side of Oak Hill road. DESCRIPTION: From parking on Oak Hill road cross the street to the gravel Oak Hill Tower road. Go around (or under) the gate and follow the former fire road. After approximately 0.5 miles you reach a stone foundation hole and a trail junction. 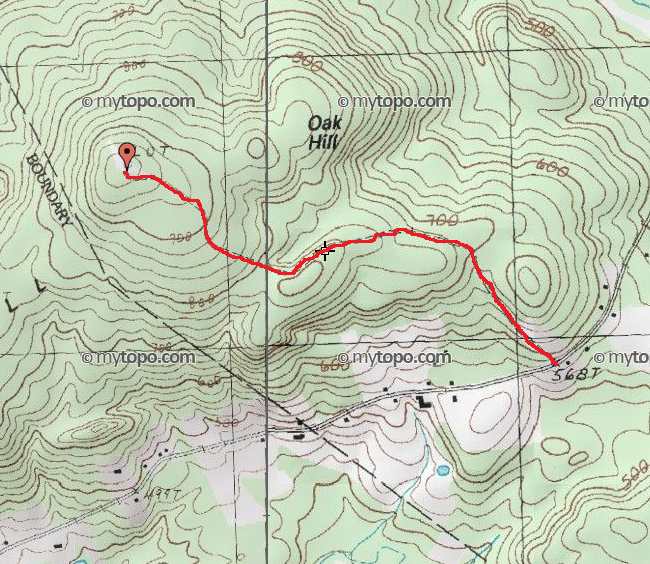 Bear left and continue the gradual ascend to the top of Oak Hill. A fire tower and benchmark disk are located at the summit. With the proximity to Concord, Oak Hill is one of the most popular climbs in the area. The trailhead is marked with a sign showing a mileage of 2.5 miles. This is the round trip distance, not one way distance. There are no views from the trail and limited views from the summit however great views to the west and the surrounding area are available if you climb to the observation platform of the tower. Mt. Kearsarge and Mt. Cardigan can both be seen on clear days. 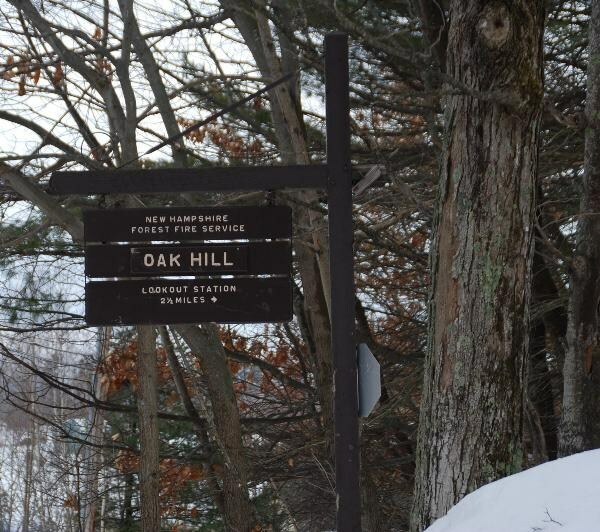 The (misleading) Oak Hill trailhead sign. Total (round trip) distance is 2.5 miles. Oak Hill is one of the remaining 16 active fire towers in the state of New Hampshire. 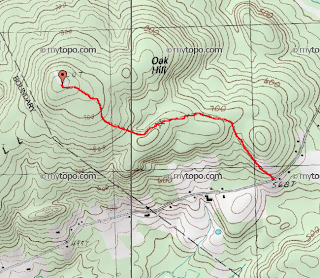 A short bushwhack from the summit to a point on the western slope will lead to the highest point in the city of Concord. 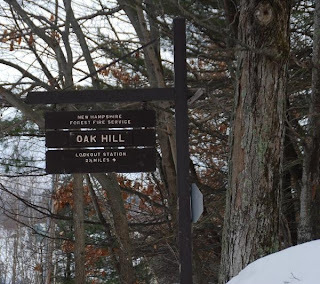 For many years the standard and typical route to Oak Hill tower has been Oak Hill road however the Concord Conservation Commission has added several new trails on the western side of Oak Hill. A large parking area on Shaker road provides access to a 1.25 mile trail named "Tower Trail" and much more of a wilderness hiking experience. Maps can be found at the Concord NH parks and recreation page.